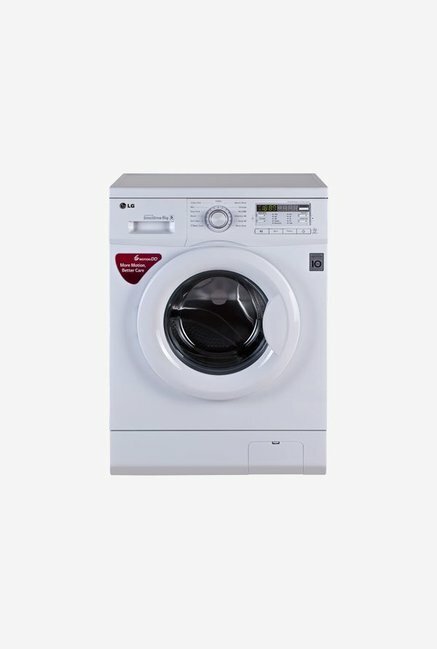 The price for LG 6 kg Fully Automatic Front Load Washing Machine ( FH0B8NDL22 ) is valid across Bangalore, Hyderabad, Chennai, Mumbai, Delhi, Pune and Kolkata. The LG 6 kg Fully Automatic Front Load Washing Machine ( FH0B8NDL22 ) is available at best price of INR 24499 on Flipkart. Very good product, got it at price of ₹23,490. Flipkart delivered on time, but demo is completed in 2mins , very bad service by jeeves. Pros: Affordable price Direct drive motor ( no noise, vibrations) Cleaning quality is good Cons: Minimum washing time is 30 min ( quick 30 ), it's better if then can have quick 15. Buy date: 18th March 2016 Review date: 8th August 2016 Quick summary: value for money. On 1000 RPM no noise. Cleaning quality is good. Quick 60,30 and mix cleaning mode is really useful. Note: Dont use rolling stand that will add vibration try to avoid it mount it at one place.